Headache conditions affect nearly everyone. Whether you get the most common form of a headache (tension headaches) or your headaches are caused by a neurological condition such as migraines, you may be surprised to find out about the key role that the neck plays in the onset of chronic headache conditions. We’re going to take a closer look at the neck to see why it can be the source of headaches. Then we will consider a natural way to find relief if your chronic headache condition is stemming from a problem in the upper cervical spine. If you are age 45 or over, then there is more than double the risk of your headaches being related to cervical disease (although this is possible at any age). What is cervical disease? How does it occur? How is this condition related to headaches? We will start by defining what cervical disease is. It occurs when the discs between the vertebrae wear out. As a result, we often just attribute this to normal wear and tear and the effects of aging. So does that mean that headaches are just a normal part of the aging process? Before you accept your condition as unavoidable, consider these other reasons that cervical disease might develop. Long periods of sitting – Sitting for hours at a time is terrible on the spine. This is especially true if you are sitting in an office and looking at screens all day or sitting in a car. In both situations, people usually fail to pay attention to posture (on top of being sedentary). As a result, the neck can become locked in a stressed position that causes the discs to break down prematurely. Trauma – Numerous forms of trauma can have a profound effect on the neck. While whiplash is common in car accidents other types of trauma such as sports injuries, slip and fall accidents, and even assaults can be to blame. If the trauma causes a misalignment of the atlas (C1 vertebra), this can cause changes throughout the neck and back and lead to degeneration of the discs. Smoking – How does smoking affect the neck? The problem is that chemicals in cigarettes thicken your blood, increase blood pressure and heart rate, and narrow your arteries. The overall effect is that your circulatory system is working harder but getting less blood and oxygen to your body. This can affect everything from the body’s ability to heal from normal wear and tear to reduced material in the discs between the vertebrae. Quitting a smoking habit may be one of the best things you can do for your headaches and your neck. Technology overuse – Technology definitely has its place. However, many of these devices were designed without any consideration of how their use would affect the human body. Take smartphones as an example. The common practice has become to look down at a smartphone at waist level to check the time, a text, or social media, and then simply slip it back in your pocket. The problem is that the neck is used to carring the 12-pound head, but when you crane your neck forward to look at your phone, you are putting about 60 pounds of pressure on the neck. 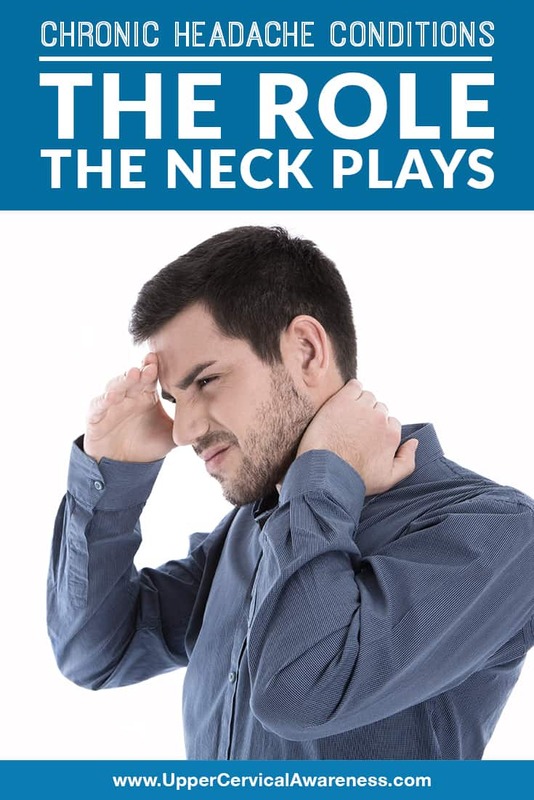 This can lead to misalignments and destabilization of the support structures of the neck, especially when the motion is repeated several times per hour, all day long. Thus, technology overuse may be contributing to how common cervical disease and chronic headache conditions are. Poor posture – This is actually a combination of a couple of the problems noted above. However, besides just poor posture while sitting or using a smartphone, there are many other times when we allow ourselves to have a forward head position. This stresses the neck and the rest of the spine and may lead to cervical disease and headaches. The health of the neck is vital when it comes to headaches because the cervical spine facilitates blood flow to the head and the atlas protects the sensitive area where the brainstem meets the spinal cord. Also, misalignments may affect the proper drainage of cerebrospinal fluid, thus leading to pooling and intracranial pressure buildup. Therefore, we would like to introduce you to a subspecialty of chiropractic called upper cervical chiropractic as a possible way to find natural help for headaches. Focus – The focus of upper cervical chiropractic is on the top two bones in the neck, the C1 and C2 vertebrae. Precision – Diagnostic imaging is used to pinpoint atlas misalignments down to hundredths of a degree. That is important in this region of the neck where fractions of a millimeter can affect the entire body. Low force – Adjustments are gentle thanks to these precision measurements. Delivered either by gentle pressure or with an adjusting instrument, an upper cervical chiropractor does not twist or jerk the neck to correct a misalignment. If you are suffering from a chronic headache condition, especially if you get neck pain or have a history of trauma, upper cervical chiropractic may be the natural therapy that you have been searching for. To learn more, schedule a no-obligation consultation with a practitioner near you today. You may be taking your first step down the road to better overall health and well-being. You may even find that your future is headache-free.